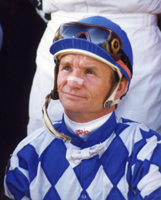 Pat Day, one of most revered jockeys in Thoroughbred racing, will make a special appearance at Sam Houston Race Park on Friday, September 10, 2004 to benefit the Racetrack Chaplaincy of America. He will take on the leading American Quarter Horse rider at Sam Houston Race Park in a Quarter Horse match race entitled "A Match Made in Heaven". Two prominent horsemen, Robert Nunnally and Jerry Windham, are sponsors of the race between Day and the leading Sam Houston Race Park Quarter Horse rider as of September 1. Danny Lavergne is the current leader with 91 wins to 77 held by J. R. Ramirez. The race, to be contested at 400-yards, will match progeny of Streakin La Jolla, owned by Nunnally against Runaway Winner, a stallion owned by Windham. The event will be run as the eighth race of the September 10 card, with $10,000 to the winner. It will be a pari-mutuel race with fans able to make win wagers on "A Match Made in Heaven". "We appreciate the generousity of Mr. Nunnally and Mr. Windham in sponsoring this race," said Eric Johnston, Sam Houston Race Park racing secretary. "Everyone at Sam Houston Race Park is looking forward to Pat Day's visit and his participation in the match race. It will be exciting for our fans as well as a wonderful way to raise money for the Racetrack Chaplaincy." Prior to his participation in "A Match Made in Heaven", Day will attend a dinner to benefit the Racetrack Chaplaincy of America in the San Jacinto Suite at Sam Houston Race Park. Tickets are available to the public for $50 and can be ordered by calling Chaplain John Shumaker at (281) 807-7236. Day, who was inducted into the Racing Hall of Fame in 1991, has won over 8,200 races in his celebrated career. He has won nine Triple Crown races and 12 Breeders' Cup victories, including four wins in the Breeders' Cup Classic. Day, 51, is an ardent supporter of the Racetrack Chaplaincy of America and is traveling to racetracks across the country to raise funds for this respected non-profit organization. The various programs offered by the Racetrack Chaplaincy include a Sunday morning worship service for horsemen and race patrons. Counseling is provided for spiritual, emotional and financial needs, as well as for gambling, marital and drug and alcohol problems. The Chaplaincy also provides clothing, blankets and food for backside workers in need. On live race nights, the Chaplain leads a prayer service for the jockeys, offering a reading and inspiration for the men and women who courageously battle for each victory.